At the end of 2016, prime minister Theresa May promised to invest an extra £4.7 billion in research and development (R&D). The government’s intention is to help the UK remain an attractive place for businesses to invest in innovation. We commissioned a comprehensive piece of research to assess the views of 1,000 senior business people on innovation, funding, Brexit implications and the government’s Industrial Strategy. It was designed to help inform the government’s consultation by providing a clear view on how businesses think the extra £4.7 billion should be spent, and what impact it will have on the UK. 73% of businesses think that Brexit makes the government’s extra spending on R&D more important. The smallest companies should be prioritised for support – says everyone, especially large companies. Grant funding and R&D tax credits are the two preferred vehicles for incentivising innovation with direct support. Investment in the UK workforce and skills was the most popular form of indirect support. The government’s consultation on Business Energy and Industrial Strategy (BEIS) is a major project that will define the UK’s industrial strategy in a post-Brexit world. The starting point for the green paper is that it acknowledges that the UK must develop a more innovative economy. One that commercialises a world-class science-base to stimulate growth. It also recognises the importance in developing skills (particularly STEM and digital subjects), upgrading infrastructure and supporting businesses to start up and grow. Against a Brexit backdrop, our survey asked businesses for their views on research and development, and the incentives available to support it. The results gave insight into the mindset of UK business. Brexit looms large and our survey results reinforce the need for a significant government increase in innovation investment to help the UK prosper. A minority of businesses thought we were lagging behind other European countries when it came to investing in R&D. However, when considering the impact the extra money would make, there was only a small increase in the number of respondents who thought it would put us ahead of European peers. Does it just help us tread water? Brexit dominates the news, with much speculation over what the full implications will entail. In this context, we asked business leaders whether they thought Brexit increases the need for extra investment in research and development. 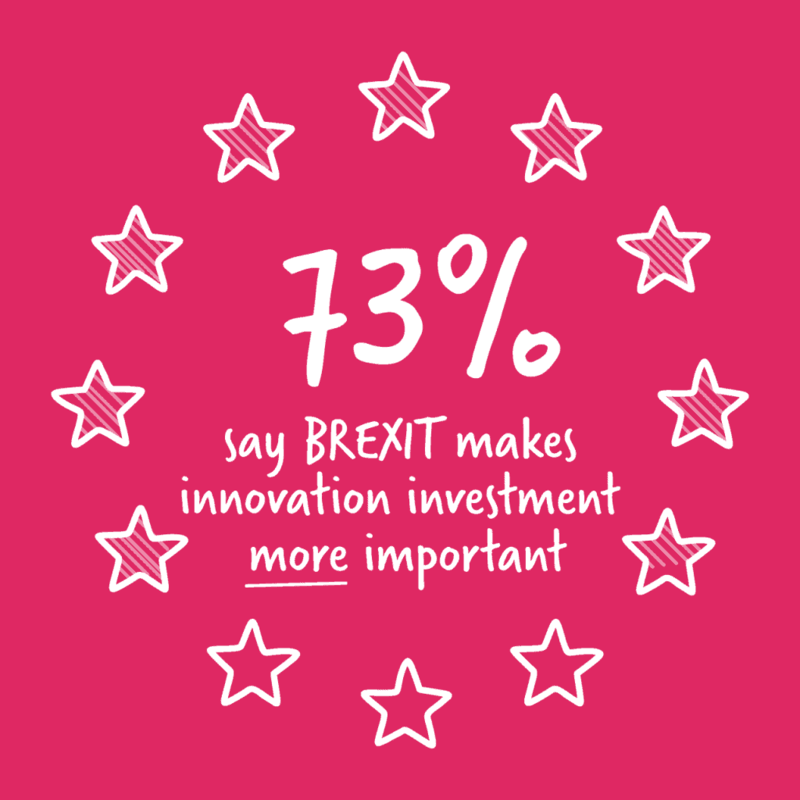 73% of businesses think Brexit makes the government’s extra spending on innovation more important. Breakdown: 32% said it was significantly more important, while 41% rated it more important. Just 3% said Brexit made extra spending less important. UK business clearly agrees that extra incentives for innovation are a crucial part of an Industrial Strategy. There are established frameworks for incentivising innovation in the UK. We examined how they were being used and how they affected attitudes to innovation. Almost one third of UK companies have benefited from grant funding. It is widely accepted that direct support for private companies has a positive impact on the economy. 30% of companies have benefited from grant funding, and 24% have received R&D tax credits. On average, 43% had not used any direct government support. But this varied by size of business greatly, with large companies being far more likely to access it. 73% of the smallest companies have never made use of government funding. A low take-up of government funding from companies employing 1-50 staff suggests they are subject to a chronic lack of awareness. Only 13% of larger companies have not accessed any funding of some sort. 41% of the smaller businesses say their ability to access funding has been a barrier to growth. A much higher proportion of larger companies claim that their ability to access finance has been a barrier to growth. One reason for this inconsistency could simply be that having not received government funding, the smaller businesses also haven’t experienced any barriers to accessing it. 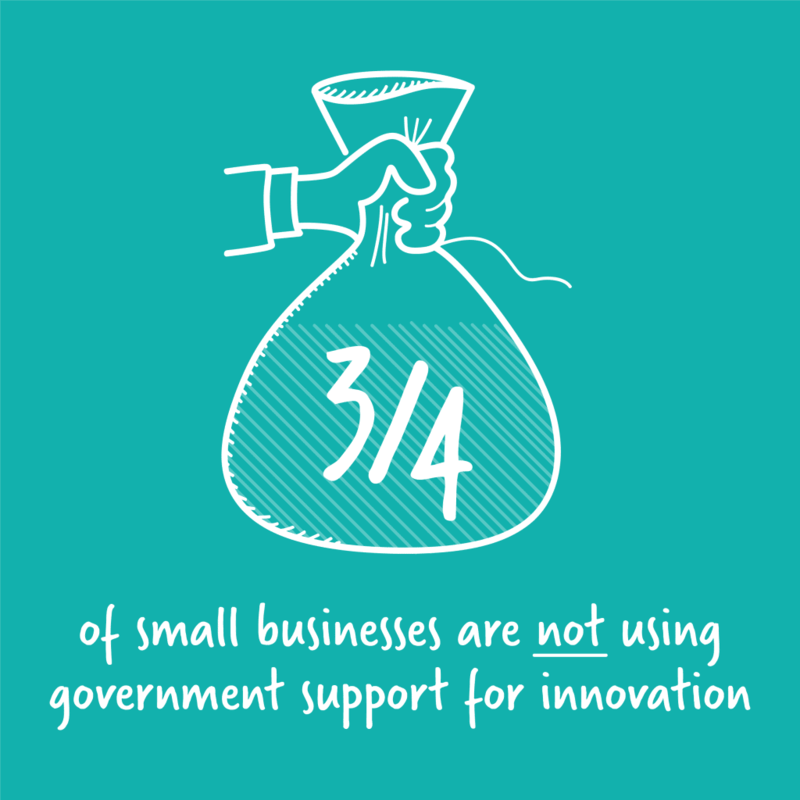 Innovation is not a high priority for more than 50% of the UK’s smallest companies. While over 80 per cent of businesses with 51+ staff stated that innovation was already either essential or a high priority, less than half of businesses who employ fewer than 50 staff said this was the case. This is significant given more than twice as many businesses with 500+ employees said that they would innovate further as a result of the proposed package than small companies and start-ups (60 per cent as compared to 28 per cent). Our experience tells us that smaller companies have less time to prioritise growth through innovation and even less to identify government funding to help them. Providing better access to support to early-stage businesses could free up their time and resources to focus on innovation. Where should the government’s extra investment in innovation be spent? With an extra £4.7 billion to be allocated, we garnered opinion from senior business people as to where it would have the most positive impact – both via direct and indirect support. UK businesses think the government should prioritise additional investment in grants and R&D tax credits. Grants were the number-one preference for direct support, followed closely by R&D tax credits. We see again a discrepancy between the smallest businesses who favour lower corporation tax, a catch-all incentive, and larger businesses who favour targeted incentives focused on innovation. Interestingly, the way grant funding and R&D tax credits interact is complicated and currently restricted by our membership of the EU. Brexit may offer the government an opportunity to revamp these two vehicles and optimise them to work together. Read more about this issue in our recent blog. Start-ups need most help, and extra funding should be focused on product development. There was little appetite for support in commercialisation of products – in contrast to the government’s focus on this phase of R&D in their Industrial Strategy as a means to drive growth. Concept development and testing was ranked priority number two. More than half of our respondents (55%) agreed that helping start-ups should be the top priority. One in five businesses would like to see government investment in UK workforce and skills. 21% of businesses would prefer to prioritise indirect support via investment in the UK workforce and skills. This view supports the government’s belief that developing skills will help people and businesses thrive. The second most-popular choice was investment in future transport and infrastructure projects. Procurement and supply-chain support saw the least clamour for investment. Does £4.7 billion do enough to promote innovation? The government has promised a substantial extra investment in R&D. It will equate to £2 billion a year by 2020. But do UK businesses consider that this sum will be sufficient to raise our innovation game? 40% of UK businesses think the extra funding for R&D is too little. However, more than 55% think that it will be sufficient. These views were consistent across businesses of all sizes and sectors. We can conclude that the stated levels of extra investment should be considered a minimum requirement. Businesses anticipate £4.7 billion extra funding will only marginally improve the UK’s innovation-standing against EU peers. At today’s funding levels (£6.3bn in 2014), 31% of businesses think we are ahead of Europe for R&D. After the funding, this rises to 36% – only a small increase in our competitiveness for what is a significant investment. How would ForrestBrown allocate £4.7 billion? That there is an Industrial Strategy is refreshing. Additional investment in science, research and innovation is absolutely critical to our success in a post-Brexit world. 1. Prioritising support for smaller and start-up companies. We think that improving government-enabling activity, such as good-quality advice and further promotion, would be an effective use of some of the extra investment. From our own experience, we know that when actually used by SMEs, R&D tax credits fulfil their purpose. The challenge is getting the message out there. The proportion of the smallest companies who have not accessed funding must be reduced. 2. Extending the use of grants and R&D tax credits to deliver targeted incentives for innovation. 3. Using the tax system to positively influence decisions to invest in R&D within smaller companies. Adjusting the SME R&D tax credit scheme-structure to align it with the above-the-line structure of RDEC (the research and development expenditure credit) for large companies would help achieve this. The RDEC scheme, introduced by the Finance Act 2013, is designed to increase the visibility and certainty of the incentive, making the incentive more effective at influencing investment decisions. As a result, RDEC has attracted more claims than its predecessor, increasing the overall level of R&D activity in the UK. Our recommendation is that the government consider making the SME scheme operate more like RDEC, albeit with a higher rate comparable to the generosity of the current relief.